Get more with Xbox One. Xbox One delivers an all-new gaming and entertainment experience that will transform how you play. Xbox One brings together the best games, the most reliable service and rich entertainment all-in-one system that is built for today and tomorrow. The most award-winning exclusive games at E3. Get it first - all Call of Duty: Ghosts downloadable content and many more. Adaptive AI that learns to play like you. Better matchmaking with Smart Match. No jerks - reputation system helps keep annoying players out of your games. No waiting in lobbies - play, watch TV, or surf the web while matchmaking happens. Never miss a moment - get multiplayer alerts while you watch TV. Switch instantly from a game to TV, a movie, music and more. Snap an app next to a game and do two things at once. The Digital System - built for the digital age using the latest technology and the power of the cloud. Keeps getting better - "cloud powered" means Xbox One and games grow with you over time. Advanced voice and motion control open up new game experiences like never before. Your Xbox One does not need to be connected for you to enjoy offline features of games. In fact, you can take the Xbox One anywhere and play any disc-based Xbox One game on it. The only times you need an online connection are for initial set-up of Xbox One, and to get the latest system and title updates before you start playing some games. Share, trade-in, resell, gift, & rent game discs to your heart's content. Use Xbox One's disc-based games just like you do today. There are no limitations to using and sharing them: it works like it does today on Xbox 360. If you'd rather get your games digitally, you can purchase from Xbox Live and get instant access to playing. Play anywhere with your own Xbox Live Gold account. A single Xbox Live Gold membership works across both Xbox One and Xbox 360 – your membership covers both. And you can log into a friend’s Xbox One and access all your downloadable games, preferences, and apps. You decide how personalized Xbox One is to you and your family, including privacy settings, manual or automatic sign-in, and how data is used. And when you play games or enjoy apps that use sensitive personal data, such as videos, photos, and facial expressions, no one except you can access it, without your express permission. Kinect or Controller: There are a variety of ways to interact with Xbox One. Depending on the game or app, you can control Xbox One using voice commands and gestures, a controller, a remote control or your Xbox One SmartGlass device. It is designed to interact with you in multiple ways. Easily turn Xbox One and Kinect on or off. To turn off your Xbox One, just say "Xbox Off." This puts Xbox One into standby mode where it's only listening for the voice command, "Xbox On." You can also turn off your Kinect through the system settings, or you can simply unplug it. 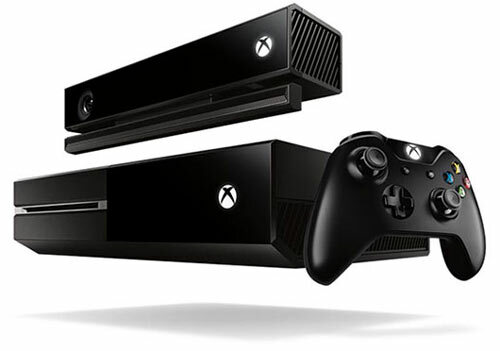 Xbox One does not require a Kinect to be plugged in for the system to function. Your Gamertag and Gamerscore follow you to Xbox One. No need to worry: you can bring your Xbox Live Gamertag and Gamerscore with you to Xbox One. Your Gamerscore will be automatically updated once you have connected to Xbox Live. Communicate with Xbox Live Gold friends using messaging or Skype. With Xbox One and an Xbox Live Gold membership, you can use Skype to voice chat with any platform that supports it. If Skype isn't supported (like on the Xbox 360), you'll still be able to see which of your friends is online and message them. * Advanced TV hardware required. Games, add-ons and media content sold separately. Initial set-up and some games and features require broadband internet; ISP fees apply. Online multiplayer, Skype and some features also require Xbox Live Gold membership (sold separately) and/or additional requirements. See xbox.com/xboxone.